Some groups needed a little guidance creating a 4th test. They all could figure out testing in hot water, room temperature water, and ice water, but then some got stuck. I reminded them that temperature is like a number line so they could mix different amounts of the supplies to get different temperatures. This was enough to get most groups going. 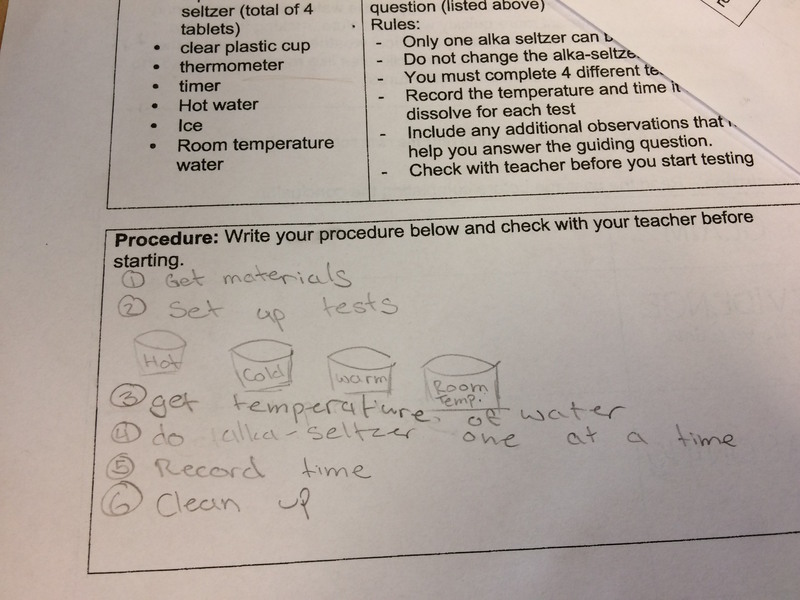 A few groups needed an even stronger hint so I would ask them if they thought they could make warm water. Once all groups had their procedures made they were all very self directed since they created their procedures they knew exactly what to do. It was beautiful. I gave them 20 minutes to test to keep them focused. We had new digital thermometers that the kids loved. They measure to the nearest 1/10th of a degree and you can choose Celsius or Fahrenheit. We got them for a future lab where we need precise measurement but since they came early we got to try them out. After testing, the students worked on their conclusions. The conclusion related our lab results to the effect of climate on the rate of weathering. They read a short passage and then wrote a C-E-R conclusion. Some students needed a little help getting started so I provided sentence starters on the ELMO. It was a fun day of teaching.